1. Players comeout of square recive the ball and pass back go back through square and find another pass. 2. Right foot, Left foot. Reds v Blues. 1 v 1, 2 v 2, 3 v 3. 4 Goal game players at either end of pitch. On coaches shout player runs down and through goal onto pitch, coach passes ball in. 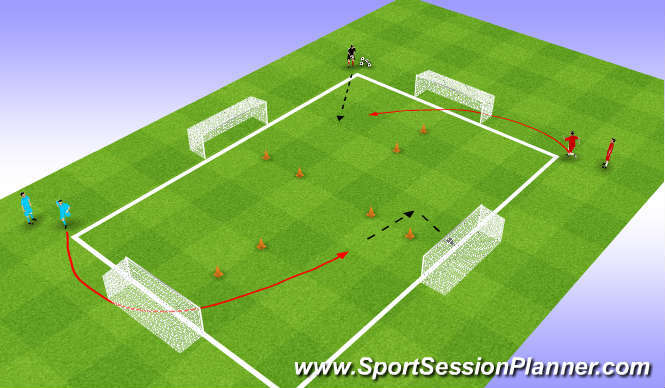 1 v 1s have to run through cones infront of goal with the ball before shooting. 2 v 2 & 3 v 3 have to pass through cones to a team mate to score. Progress to a 7 v7 with U11s. Passing (weight abd distance, what part of foot, disguse) decision making. Head up dont force the pass find another goal to attack, be clever, runs off the ball. Running long and short, high intensity, agility, balance, co ordination. After a slow start players grew in confidence and there decision making improved so they had more success in the game.